We’re taking a break from our regularly-scheduled Feral Friday programming to bring you an artifact from the ufological past, courtesy Kenn Thomas, author of our recently-released book JFK & UFO. “The Maury Island Mystery” is a comic book published by Western Publishing Company in 1968, and it can be seen in its full glory below after Kenn’s introduction. This comic book story about the Maury Island incident gets some of the details wrong but gives the event more attention in the national press than it got before the publication of the new book, JFK & UFO. 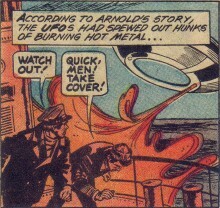 Interestingly, the same publisher produced the comic book version of the TV show The Invaders, which Fred Crisman, the man in this comic, said was about his life. Critics, of course, will take the obvious swipes at the TV and comic book tapestry of JFK and UFO data points. To do that, though, they must overlook actual aspects of JFK’s death that make it seem like a real-life science fiction nightmare. Prosecutor Jim Garrison believed that Fred Crisman worked as a hired assassin for the military-industrial complex, more specifically for Boeing in Seattle. The last speech that JFK made had to do with defense contract he had given to General Dynamics over Boeing in a highly controversial decision, as documented in JFK & UFO. The contract had to do with the TFX tactical fighter, which later became the F-111 and was sold to Australia, creating a funding corridor that led to the development of Pine Gap — considered that country’s Area 51. Lee Harvey Oswald served as a Marine at Atsugi air base in Japan. Shortly after he defected to the Soviet Union, the Soviets were able to shoot down Gary Powers’ U2; the job Oswald had before going to the Book Depository was with a firm that processed U2 film–he was some kind of agent attached to the U2, which was developed at the infamous Area 51. Sounds like the stuff of comic books, doesn’t it?